I was excited about this one: seeing George Lucas’ original ideas for Star Wars turned into a graphic novel. The main thing to remember when starting to read this is that it is based off of an unfinished work. The technology, world building, plot and characters are full of holes. That being said, I’m on the fence of wether the writer and artist should have taken up more of a chance on their creative license or not. 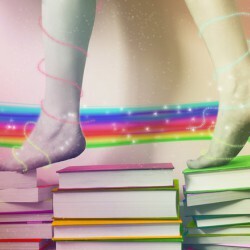 I didn’t want a completely finished work, but leaving the story as it was left the novel very jumpy and hard to follow. The highlight of this novel is comparing the original script to the script that made the big-screen. We see familiar characters’ names playing different roles, characters we know shown with a bit of a twist (alien Han Solo), as well as introductions of new characters. Prince Valorum, a Knight of the Sith, is a particularly entertaining character. As with most graphic novels, concept art is included in the back of the novel including feedback from the artist/writer on how they ultimately made their decisions. Also included are concept panels that were originally sent to George Lucas to get his support on the idea of creating the graphic novel. 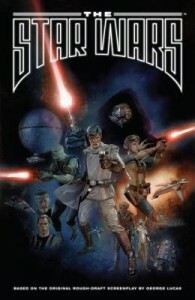 Overall, as a graphic novel alone I wouldn’t recommend it, but any fan of Star Wars would love to compare the original ideas and characters to the stories that they know so well. Defiantly one to add to the shelves.